J Clin Invest. 2004;114(11):1530–1530. https://doi.org/10.1172/JCI23795. Gerald M. Edelman. 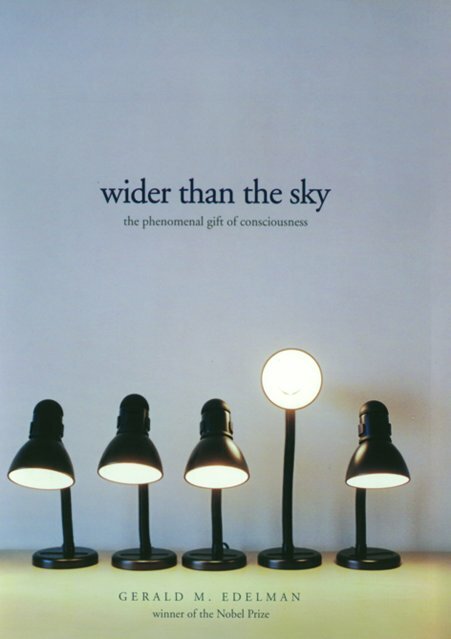 Wider than the sky The phenomenal gift of consciousness. 2004. Yale University Press. New Haven, Connecticut, USA. 224 pp. $24.00. ISBN: 0-300-10229-1 (hardcover). Gerald M. Edelman won the Nobel Prize for discoveries in immunology before turning his mind to what Pulitzer Prize-winning evolutionary biologist E.O. Wilson has called “the master unsolved problem of biology: how the hundred million nerve cells of the brain work together to create consciousness.” Wider than the sky: the phenomenal gift of consciousness presents a succinct account of Edelman’s proposals on consciousness and is the most recent in a stream of related publications over the last three decades. The book is aimed at the general reader and is packed with ideas; indeed, a semester (or a lifetime) could be spent fleshing out its suggestions and exploring their experimental bases. The price paid for such a concise presentation is a tendency toward an abstract style, but the book would make a good starting place for a reader seeking an introduction to one of the most powerful contemporary approaches to the science of consciousness. The early chapters of the book outline Edelman’s account of the neural basis of “primary consciousness,” his term for the varieties of perceptual awareness that we — presumably — share with many animals. He locates this neural basis in a “dynamic core” of neuronal interactions, a dominant but constantly shifting nexus of activity that plays across the cerebral cortex, coloring the shades of our experience as its internal alliances form and break. Edelman explores two approaches to understanding how these neuronal networks came to be. The first, his “theory of neuronal group selection,” uses a Darwinian model to explain how such networks are generated during the brain’s development, selected through interaction with the environment, and consolidated by a process of “reentry” that creates stable long-range “mappings” across the cortex. The second approach identifies the role of exchanges between anterior brain systems, concerned with memory and the evaluation of experience, and posterior regions, concerned with perceptual categorization. The ultimate work of the dynamic core is to enable the infinity of discriminations summarized in the “scenes” of our perceptual experience, which constitute primary consciousness. Edelman believes that selfhood and subjectivity, two of the defining features of consciousness, result naturally from the ideas just outlined: selfhood is a consequence of the grounding of all our later experiences in early perceptions of the internal environment; subjectivity results from the unique developmental trajectory of each and every human mind. Later chapters extend the theory of primary consciousness to an account of “higher order consciousness,” which comprises awareness of the past, the future, and the self that surveys them. Edelman links this closely, though not exclusively, to our command of language and our associated “semantic capabilities” (using the term “semantic” in a sense close to “symbolic”). Edelman also discusses the topic of neuronal complexity developed in his previous work, arguing that this can best be understood in terms of the simultaneous compartmentalization and integration of brain function. The movement in Edelman’s exposition from simple to sophisticated forms of consciousness indicates that his theory is conceived “bottom-up.” This is in contrast to the “top-down” theories emerging from social psychology and ethology, which propose that consciousness is a relatively recent arrival on the biological scene, required to enable us to read the minds of others. In many respects, Edelman’s work is in the mainstream of contemporary consciousness science, and his book can be read as a primer. The broad notion of the “dynamic core” and the emphasis on the importance of large-scale neuronal integration linking anterior and posterior brain regions in the genesis of consciousness have clear parallels in the work of Bernard Baars and Stanislav Dehaene, two other leading theorists of consciousness. The tendency for each of the current theories of consciousness, including Edelman’s, to spawn its own theoretical vocabulary is a sign that the subject is young and still finding its way to a solid scientific consensus. There are some ghosts lurking in the wings of the subject that, I sense, haunt Edelman (along with the rest of us) still. “Consciousness,” of course, is by no means a straightforward term of science; it has a long philosophical, religious, and cultural history that shapes our expectations of what a theory on the subject should deliver. This creates an opportunity — and a need — for philosophers and scientists to renew their old alliance in the study of awareness; this alliance should help us to define what to ask of a scientific theory of consciousness. Although I doubt that he would be comfortable with the following descriptions, Edelman’s account of consciousness suggests to me that he is a property dualist and an epiphenomenalist. That is to say he regards the conscious properties of neural states as different in kind from the physical properties of the brain (he describes these conscious properties without much further explication as resulting from a “phenomenal transform,”), and he regards them as being causally impotent. These claims about the ultimate nature and causal role of mental events enter on difficult, contested ground. None of us will be entirely satisfied with the science of consciousness until this field’s murky philosophical hinterland — which might be labeled, like a medieval map, with the warning “here be monsters” — is clarified.